Another interesting kind of bet you can make in a roulette game is the outside bet. It encompasses all bets which are placed outside the main field of numbers on the roulette betting layout. In this post, you’d get to learn more about outside bets like what are the several types of wagers which belong to this category, how to make them, and what are its respective payoffs. Like the previous article about Inside Bets, we’ll be referring to the American roulette version as basis for our examples. 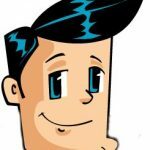 Outside bet is probably the safest and the easiest kind of bet a roulette player can make. Most experts would recommend novice players to build experience in playing roulette by doing outside bets first. Contrary to what many people would think, roulette outside bets do offer reasonable payouts for wagers in a way that they carry with them a high winning probability. This is unlike inside bets. Though the latter has huge potential earnings, it is however compensated with the low probability of winning. We also said “the safest” kind of bet because outside bets cover large groups of numbers in the roulette betting layout. Level headed players, meanwhile, benefit most the moderate risk it takes to pull off an outside bet. In case one of the 12 numbers of the particular dozen wins, the payoff will be 2 to 1. It is important to note that in American Roulette, neither the single zero nor the double zero belongs to any of the three dozen groups. In case the spin results to either of the zeroes, this means the player has lost. 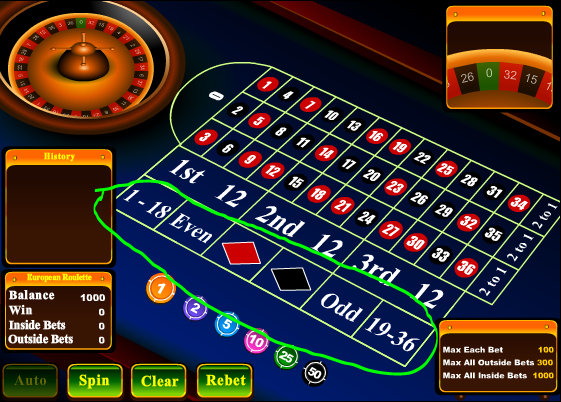 Like the Dozen bets, the Column Bets also feature 12 numbers set in a column on the roulette betting layout. Each column bet has its own bet box indicated at the bottom of the column. They are further marked with the offered payout which is 2 to 1. Again, neither the single zero nor the double zero belongs to either of the three columns. One of the most popular outside bet is the Color Bet which opt players to predict whether the next result is a Red or Black number. The Color Bet field can be found in the betting layout labelled as its own color or as to how they are spelled. In this bet, players place bets on either 18 of the red numbers or 18 of its counterpart color. The payoff of a winning color bet is 1 to 1. As often the case, the single zero and the double zero are not covered in the colored bet. The Even/Odd Bets opt players to place their bets on either of the 18 even numbers or the 18 odd ones in the roulette betting layout. One important note: if in mathematics 0 is considered an even number, in roulette, it is not. Which is why, a single zero and a double zero result means a loss to the player. The same with the color bet, even/odd bet pays off a winning bet 1 to 1. At the far end corners of the outside betting layout are the Low and High Bets. The boxes are labelled as “1-18” as the first 18 numbers of the roulette, and “19-36,” which includes all the second set of 18 numbers. The single zero and double zero are once again an exempt of the rule. If the player wins, the payoff is 1 to 1. The last, least often heard outside bet is the Snake Bet. This bet covers the numbers 1, 5, 9, 12, 14, 16, 19, 23, 27, 30, 32, and 34. When any of the number comes out after a spin, the player gets a 2-to-1 payoff. The bet is made simply by placing your chip or stacks of chip on the low corner of number 34 which can be found adjacent to the High Even-Money bet (“19-36”).